World acclaimed Herreshoff ketch can cruise the globe. With their bulletproof construction these boats are not built to a price, so fall into the category of Oyster and Bluewater yachts in the cruising arena. The moment you step on board "Little Realm" you have entered a very special place with a quality that is apparent. The boat doesn't move at all. You will know this can be your home away from home. 'Little Realm' is a copy Herreshoff Ketch built in New Zealand by master boat builder Alexander Nichols in 1983. 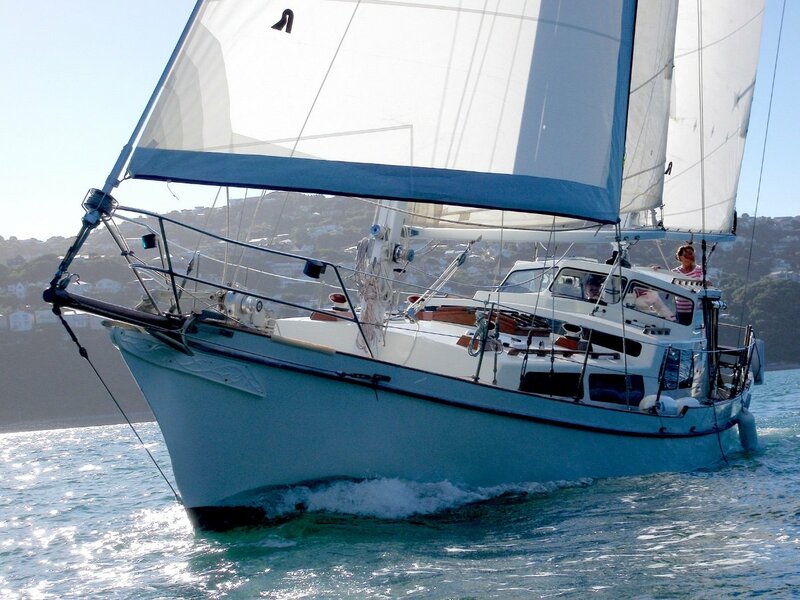 Designed for comfortable cruising and ocean voyaging, she has a 3/4 length keel, with accompanying larger volumes for extra water, fuel and stowage. Excellent weather protection provided by a solid cockpit dodger - with roll up 'clear curtains to fully (or partly) enclose cockpit as required. You have to get on board to appreciate what a lovely cruising yacht this is, and with the panoramic windows you will always be enjoying the ever changing view. Perkins 75hp with full access to all sides of the motor and manuals always well serviced - Highly reliable - offering extra power when needed. Provides economical 6-7 kt motoring options a relatively quiet 1500 - 1700 RPM. Include a well thought out galley to port (with generous bench space and feature window views for the chef) and super large SS refrigeration and separate cold storage units installed to starboard. The main Saloon area is forward of the galley and features the same lovely 'traditional wood' finish - with dining table to port and settee opposite. A lovely space with stove, oven, sink and plenty of storage, it's also in a great shape for passage making with benches all round and safe and secure. V berth FWD Cabin which has 2 berths, hanging locker and drawers. And the saloon accommodates another 2 adults. The 'design brief' has traded 'weekender quarter berths' for a large outdoor sail locker in the cockpit to starboard and a large 220 l SS diesel tank to port. This set up works well for serious cruising options. Hard top cockpit and roll up clears. This is a boat designed to last in the elements with minimum perishable surfaces. Jack lines and all the usual gear for passage making including 2 horseshoe life buoys on pushpit bracket. For her Tasman Ocean crossing in 2015,'LR' was equipped to Cat 1 level with Liferaft, Sea Parachute and all designated safety equipment. Additionally to Cat 1 requirements, a robust L&S heavy duty hydraulic ram. TMC auto helm linked to a L & S hydraulic ram unit designed for long passage making and reliability and makes short hand passage making easy. Raymarine VHF and separate hand held, chart plotter and wind and speed instruments. Also a dedicated computer/chart system used as a constant cockpit display via laptop with world charts and its own 300w inverter. Raymarine Depth. Mast painted and rigging done in 2014 The Ketch rig allows easy management of flexible sail plan options.